This handwoven seagrass coffin has light brown and beige hues with subtle hints of green. The durable seagrass (common in floor coverings) is sustainably harvested under supervision of the Chinese government. The Natural Burial Company is currently obtaining documentation of their environmental monitoring procedures. They are suitable for burial or cremation. Wooden runners or a plywood base can be fitted to the underside of the coffin to facilitate the cremation process. Each coffin will carry up to 250lbs (114kg) in weight. 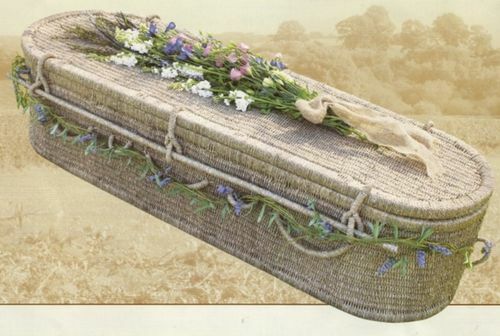 Each coffin has a natural liner, and is fitted with flower rings, seagrass carrying poles and woven handles.